“I transferred to Crash Investigation Services in September 2007, and since that time I have attended around 250 crashes. Of all the fatal crashes I have attended I remember the date of the crash and the name of the deceased for every single one of them. “I often get asked, ‘How do you do it? Attending crashes where people are seriously injured and killed must take a toll’. Every fatal crash I attend I always spare a thought for the person who has just lost their life. It doesn’t matter how old they were or if they were partially to blame for their own demise. I don’t dwell on this aspect of the crash. It would not be wise or practical to get emotionally invested. “It is the job of the crash investigator to gather evidence, analyse the scene and present the facts to a Coroner or the courts. It’s important to remain focused on the task and remain impartial. 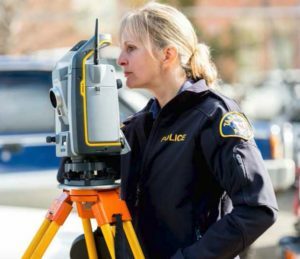 “The aspect of crash investigation I enjoy the most is being able to follow an investigation from the initial incident all the way through to the end. It’s never wise to jump to conclusions or to make assumptions about how or why a crash has occurred. The smallest detail can change the entire course of the investigation. One small piece of evidence can mean the difference between a person being charged or not. Sometimes the key evidentiary item is small and easily missed amongst the mass of debris at a scene. “It is satisfying being able to answer the multitude of questions surviving family members have. Although sometimes it is difficult for family to hear the circumstances surrounding their loved one’s passing I believe that it is important for their long term healing to know the truth. Providing answers to the grieving is very satisfying for me. Sometimes there are missing pieces of the puzzle which is frustrating for me as an investigator and for the family. I can only tell them what I see and what I can prove. Sometimes the only person who truly knows what happened is no longer with us. was it was a very long day. I started work at 8am and concluded duty at 5am the following morning. “First and foremost I believe it is important to have a good working relationship with the people in the office. I have been very lucky to have worked with Sergeant Rod Carrick over the last 10 years. He has a wealth of knowledge and is such a great support. Above: Constable Kelly Cordwell surveying a crash scene. This page -- https://www.police.tas.gov.au/about-us/100-years-women-policing-tasmania-police/women-specialist-roles/smallest-detail-can-change-entire-course-investigation/ -- was last published on February 13, 2018 by the Department of Police, Fire and Emergency Management.